Virginia Woolf's Mrs. Dalloway is considered by many to be an important feminist work, one that most people have not read (or even heard of). It follows one day in the life of the title character, as she prepares for a party that never happens. Author Michael Cunningham ingeniously used the novel in his own novel, The Hours, which told three different stories of women all related to Mrs. Dalloway. It is a complex and absorbing novel that was good enough to win the Pulizter Prize. So it is a daunting task to adapt it to the screen, yet director Stephen Daldry (Billy Elliot, Eight) and screenwriter David Hare (Via Dolorosa, Damage) do an adroit job of it. Like Mrs. Dalloway, The Hours follows one day in the life of these three women. It helps that the main cast is Nicole Kidman, Julianne Moore, and Meryl Streep, who are among the top tier of female actors currently working. All three stories are linked by severe depression, an attempted suicide, and a lesbian kiss. 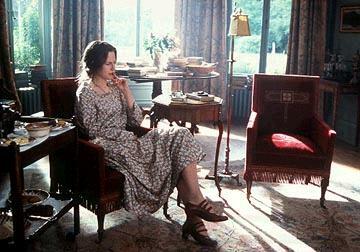 Woolf (Kidman, Birthday Girl, The Others) is beginning to write her novel Mrs. Dalloway. She is living in the countryside, wracked with depression and hearing voices. Her husband Leonard (Stephen Dillane, The Truth About Charlie, Spy Game) is at his wits end trying to care for her. This is another strong performance by Kidman (in a prosthetic nose), who channels all of her problems into her writing. Woolf is frustrated that she has little control over her life, a theme also present in the other two stories. In the mid-twentieth century, housewife Laura Brown (Moore, Far From Heaven, The Shipping News) is beginning to read Mrs. Dalloway. Her husband (John C. Reilly, Chicago, Gangs of New York) is happy, but she is not. Every little mistake she makes causes her infinitely more pain. The final story takes place in 2001. Clarissa (Streep, Adaptation, A.I.) is planning a party for her ex-husband Richard (Ed Harris, A Beautiful Mind, Enemy at the Gates), who just won a prestigious award. Richard is dying of AIDS, and the two are still close although Clarissa has lived with another woman for years. Clarissa is the type of person who is too busy to recognize how empty her life is. She mistakenly believes that controlling all the things around her makes her happy. 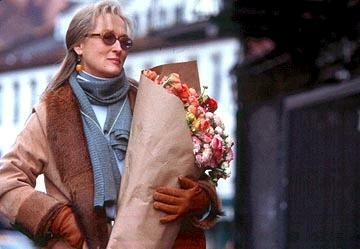 In more ways than one, Clarissa is Mrs. Dalloway (Mrs. Dalloway's first name was Clarissa). Daldry and Hare switch between all three stories, but it never becomes confusing. They use simple things to link scenes from the different eras. Kidman will write a line, Moore will read the line, then Streep will say it. Or, they will link their actions, whether it be looking in a mirror or tying their hair. It never gets repetitious either. With so much going on, Hare still manages to script a taut, engaging screenplay that seems to fly by. Philip Glass (Naqoyqatsi, Diasporai) also adds a good score, heavy on the piano and strings. The themes amplify themselves when viewed in triplicate, and each era is done different enough to give a fuller sense of the depression that each character feels. And one cannot say enough about the three lead actresses. Their performances here are simply amazing. Mongoose Rates It: Pretty Good. 1 hour, 54 minutes, Rated PG-13 for mature thematic elements, some disturbing images and brief language.